iExplorer is popular in the management of files on iPhone, iPod and iPad, which is a program to allow you to use your iPhone, iPod and iPad as an external hard drive. Thus, you can use it to view the files and folders on your iPhone, iPod and iPad. However, there are some shortcomings of this software, which will be introduced in the first part of this guidance. Therefore, you may want to know which the best alternative to iExplorer is. After a lot of search, I luckily come across Leawo iTransfer, which comes with all the features iExplorer owns but performs even better. Moreover, I will also tell you how to use iTunes as a free iExplorer alternative as well. Let’s begin to see what the iExplorer alternatives for iPhone, iPad and iPod are. With the help of iExplorer, you can easily browse and export music to iTunes and computer, and transfer messages, Address Book contacts, voicemail, voice memo, calendar events, and more to computer from iPhone, iPod and iPad. Additionally, you can take advantage of it to mount your iDevices as external hard drives. Therefore, iExplorer can help users manage their iDevice more conveniently. As for how to use iExplorer, I’d like to take how to transfer music from iPhone to iPhone using iExplorer for example. 1. Download and install the latest version of iTunes on your computer and launch it. Then head to “iTunes > Preferences > Devices” and put a checkmark beside “Prevent iPods, iPhones and iPads from syncing automatically”. Finally, click on “OK” to confirm your option. 2. Plug your iPhone into your computer and iTunes may prompt you to sync your device, then you need to click “No” or “Cancel”. 3. Navigate to iExplorer and open it. A “Device Overview” interface will display. Then you can tap on “Music” in the middle of the interface. You can also find the music you need to transfer by tapping on the “Music Library” on the left of the interface. 4. Choose the music you want to transfer to another iPhone, and click on the “Transfer” button at the bottom of the interface. Then tap on “Export Selected Item(s) to Folder”. A pop-up box will ask you to choose a folder, then you can choose a folder on your computer. The music you have selected will be transferred to the folder, and you only need to wait until the transfer is over. 5. You need to disconnect your iPhone. 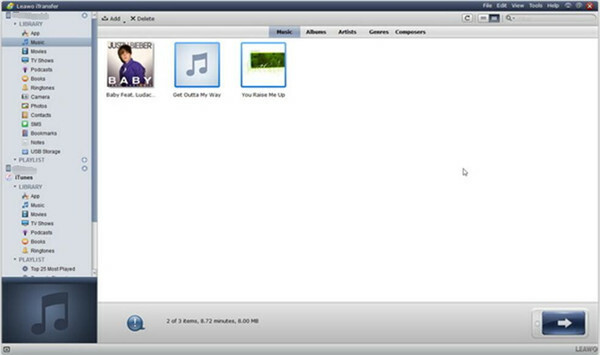 Launch iTunes on your computer and drag the folder includes your needed music into a new library. For easier access to these music, you can create a new playlist. 6. Connect another iPhone to your computer. Choose all the music that has been copied recently and drag into the name of iPhone on the left interface of iTunes. Then all music will be synced to another iPhone. You can also transfer other files between iOS devices via iExplorer. Although this is not a cakewalk, you may get accustomed to it if you try it for several times. Although iExplorer has so many powerful functions and always assists people a lot, it also has some drawbacks. 1. In order to mount the iPhone, iPad or iPod to a Mac finder or Windows explorer and be able to view audio as well as video files, installation of the QuickTime drive and disk-mounting framework has to be completed. This will take much extra space on your computer. 2. iExplorer can’t import music, photos, videos and more files from computer to iPhone/iPad/iPod or from one iDevice to another. 3. The user interface is not friendly enough and it is a little bit complex to use. Therefore, if you are fed up with the flaws of it, you can find a more functional and easier-to-handle alternative to iExplorer. And you have come to the right place. Among various iExplorer alternatives, iTunes and Leawo iTransfer stand out, for they truly give a smooth and easy file managing experience for iOS users. Continue to read this guidance to see iExplorer free alternative — iTunes and best alternative to iExplorer — Leawo iTransfer. iTunes is a media player, media library, online radio broadcaster, and mobile device management application developed by Apple Inc. 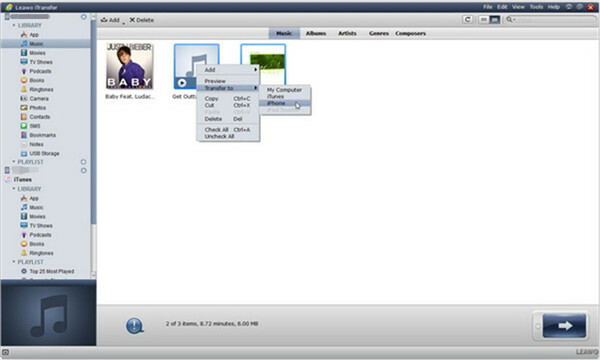 It is used to play, download, and organize digital downloads of music and video (as well as other types of media available on the iTunes Store) on personal computers. The iTunes Store is also available on the iPhone, iPad, and iPod. As a free iExplorer alternative, you can use iTunes to transfer and manage data for iOS devices, such as MP3, MP4, books, etc. It also can work without the Internet. However, the flaw of this free alternative to iExplorer is that when you use iTunes to transfer one type of files between iOS devices, other data on one iDvice will also be transferred to the other. Here I would like to show you how to transfer contacts from iPod to iPhone with iExplorer free alternative — iTunes — as an example. 1. 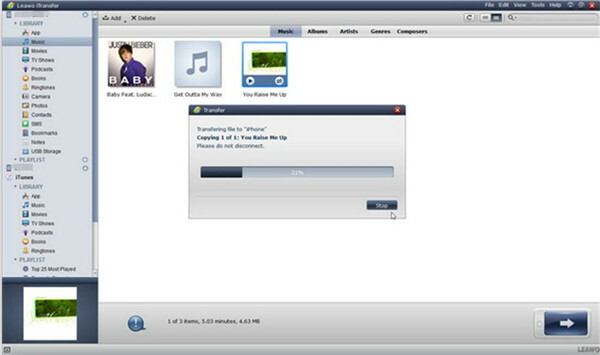 Connect you iPod to your computer and run iTunes. 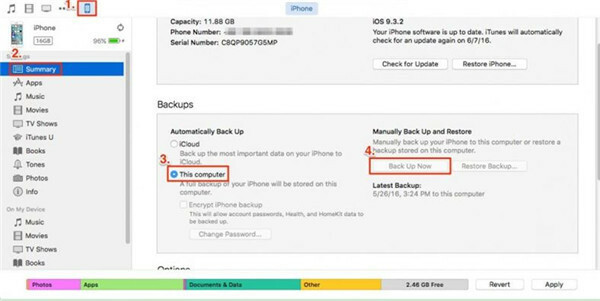 Navigate to “Device > Summary > Backups > This computer > Backup Now”. All your contacts on iPod will be transferred to your computer. 2. Wait until the backup process is over. Then connect your iPhone with your computer. Launch iTunes and then tap the device tab. 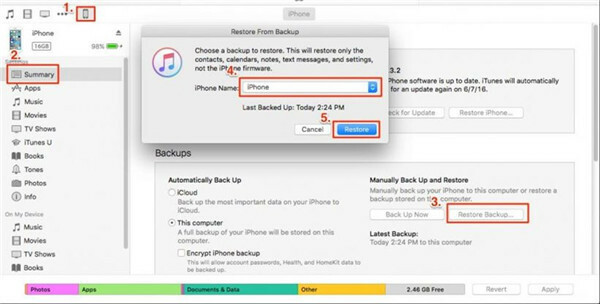 Tap “Summary > Restore Backup” to choose the backup that you have created, and finally tap on the “Restore” button. Now all your contacts will be transferred to your iPhone. Obviously, to transfer files and data from one iOS device to another with iTunes as a free alternative to iExplorer is actually to back up one iDevice and restore to another iDevice. If you don’t mind transferring all files and data from one to another, you can try to use iTunes as the free iExplorer alternative. You can also use “File Sharing” function of iTunes, free alternative to iExplorer, to manage files and data of iOS devices from computer. Here I would like to take iPhone for instance. 1. Click the iPhone icon on the main interface of iTunes. 2. Then click “Apps > File Sharing” to select one app to see which data can be shared in that app on your iPhone. 3. Select one app from the listed ones in the “File Sharing” section. Scroll and drop files from the “Documents” list to a folder on your computer to copy them to your computer. You can also choose the file you need to save to your computer from the “Documents” list and click “Save to”, then locate the folder on your computer to which you want to copy the files and tap “Save To”. 4. Then you can open the files from your computer with the app that you chose for “File Sharing”. You can see the file list in the “File Sharing” section of iTunes when your iPhone is connected to your computer. 5. You can also click “On My Device” to view and play some files under this menu, such as music, books, movies and etc. 6. You can head to the iTunes Store to download or buy some useful files, such as music, apps, movies, and podcasts, etc. in case you need. By reading the above introduction, you know that you can use this iExplorer free alternative to transfer and manage data for iOS devices. However, if you don’t like the drawback of iTunes — to destroy all existed files on the other iDevice while transferring files from one iDevice to the other, you can try the best iExplorer alternative. Actually, Leawo iTransfer is regarded as the best iExplorer alternative. Why? Leawo iTransfer is an all-around & full-way iOS file management tool that can help iPhone, iPad and iPod users. 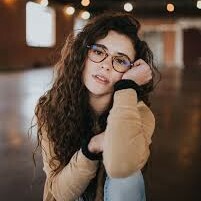 It works well on Windows and Mac, which supports managing up to 14 types of content on iDevices, like photos, videos, music, messages, books, etc. You can also use this best alternative to iExplorer to enjoy the transferring experience: between iDevice and computer, iDevice and iTunes, iDevice and iDevice. In the below guide, I will show you steps to transfer and manage iOS data with Leawo iTransfer. You can take advantage of Leawo iTransfer to transfer data and files between iPad, iPod and iPhone. The function of this program is powerful. 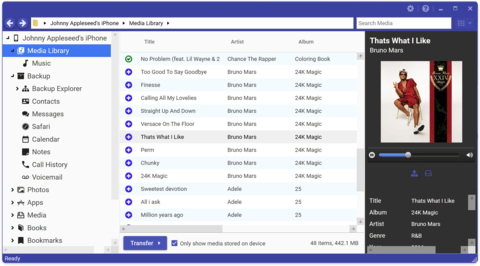 The following guidance will take how to transfer music from iPad to iPhone with this best iExplore alternative for example. Open Leawo iTransfer and then plug both your iPhone and iPad to your computer with matched USB cables. Head to your iPad icon and select “Music” under the “LIBRARY” menu. The contents will show in the right window. Choose the music you need to transfer, and tap on the “Transfer” button at the right bottom. Put a checkmark beside “Transfer to List” and select “iPhone” as the target. Then tap on “Transfer Now”, the iPad music that you have selected will be moved to iPhone. The process will take a few minutes, and you can see the transfer procedure clearly in the percentage panel. Wait until the transfer is over, you will get the music in your iPhone. As the best alternative to iExplorer, Leawo iTransfer is helpful for transferring various kinds of files among iOS devices, iTunes and computers, and it will offer users much convenience to transfer data. You can have a try on this most powerful iOS file management tool after reading this part on what is the best alternative to iExplorer. By transferring files among iOS devices, you can enjoy the file sharing experience. 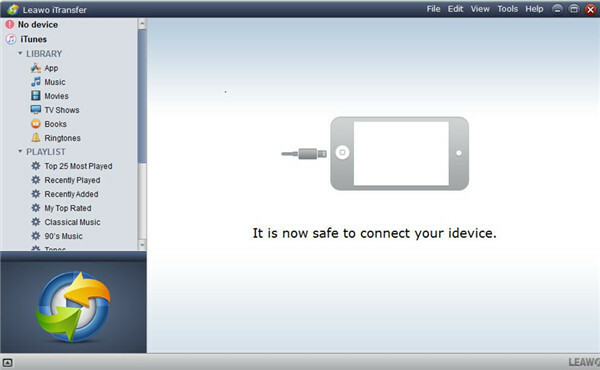 Moreover, you can also transfer your files on your iDevice to your computer for your convenience to manage iDevice files and data, and you can also transfer the edited files from your computer to your iDevice. This program is really professional. You can’t miss it.